EDMONTON – Showing the patience that comes with experience, Brad Gushue and Glenn Howard led their teams to victories Tuesday afternoon to remain unbeaten after eight draws of the Tim Hortons Brier, presented by Monsanto. Four-time champion Kevin Martin of Alberta lost another narrow decision to all but end his playoff hopes. Both Gushue’s Newfoundland-Labrador foursome and Howard’s Ontario crew fell behind early but neither panicked. Gushue scored two in the second end and another pair in the sixth to beat Andrew Bilesky of British Columbia 6-3. 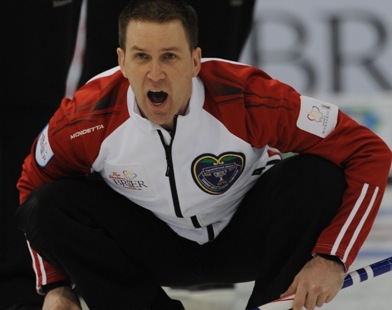 “It was a close game but we felt like we were in control right from the get-go,” said Gushue. “We played really solid, didn’t make any big mistakes. Even though it was tied 2-2 we felt if we just continue to play the way we’re playing eventually we’ll get our deuce. Meanwhile, New Brunswick’s James Grattan subdued the Rexall Place crowd with a 6-5 win over the Albertans. New Brunswick stole singles in the first two ends, shaking the tentative confidence of the Martin foursome that has struggled all week before a hometown crowd. But Alberta fought back, scoring two in the ninth end to tie the game. Grattan chipped a Martin counter off the button with his last rock for the victory. That came after the New Brunswick skip’s first shot had slid to the back to the button, leaving a narrow opening for Martin. 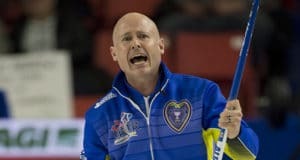 Howard trailed Jamie Koe and his Northwest Territories/Yukon team 2-0 after three ends but stole deuces in the fifth and sixth ends to roll to a 7-4 win. 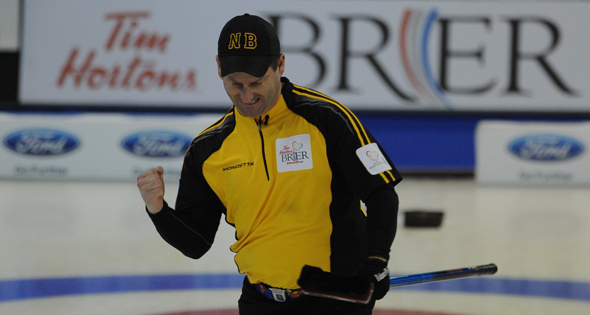 In the other seventh-draw game, Jeff Stoughton of Manitoba rolled past Eddie MacKenzie of Prince Edward Island 9-2. The results left Gushue at 6-0 and Howard at 5-0. Manitoba improved to 4-1 and tied with Northern Ontario and Quebec. New Brunswick and Northwest Territories/Yukon sit at 3-3, Saskatchewan is 2-3, Alberta 1-4, B.C., and Nova Scotia 0-6 and P.E.I. 0-6. Tuesday’s 6:30 p.m. MST draw (TSN-RDS) featured an all-Ontario match with Howard facing off against unbeaten Brad Jacobs of Northern Ontario. Other games will see Quebec play B.C., Alberta take on Nova Scotia and Manitoba meet Saskatchewan.